Marriage breakdown is a painful process especially when children are involved. If you are unsure about working on your relationship discernment counselling is a way for you and your spouse to look at your options before making a final decision about divorce. As a Certified Discernment Counsellor I can help you and your partner develop a deeper understanding of what happened to your relationship – and what each person’s contributions to the problems are – so you can make a clear decision about the future of your relationship. Discernment counselling is most appropriate for couples where one partner wants to preserve and repair the relationship and the other is leaning towards ending it. This kind of “mixed agenda” is common among couples approaching divorce, and up to now, there has been a real dearth of special services to address their needs. It is always short term. WHAT CAN COUPLES EXPECT TO GAIN FROM DISCERNMENT COUNSELLING? 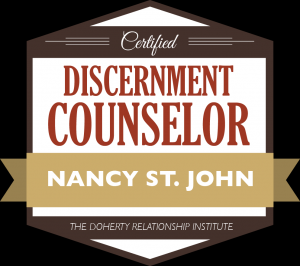 WHAT DOES DISCERNMENT COUNSELLING INVOLVE? Path 3: Embarking on a reconciliation period during which divorce is taken off the table with both partners making an all-out effort in couples therapy (and other resources if necessary) before making a decision about the long-term future of the marriage. Discernment counselling mostly involves individual sessions. As a discernment counsellor I can help both partners see their individual contributions to the problems and the possible solutions. Each partner understanding their own contributions to the problems will be important to the success of future relationships even if this one ends. Discernment counselling is considered successful when people have clarity and confidence in their decision and when they more fully understand what’s happened to their relationship. Discernment counselling can be as brief as one session and as long as five sessions. You decide each time whether to come back for a subsequent session. The sessions are 1½ hours long. When there is any form of protection order from a court.